1. Preheat the oven to 190°C, gas mark 5. 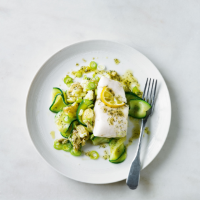 Place the bags with cod fillets, herb butter, lemon slices and parsley on a baking sheet. Bake for 20 minutes until the fish is cooked through and flakes easily. 2. Meanwhile, cook the new potatoes in a pan of boiling water for 12 minutes. Add the courgettes to the pan and cook for a further 2–3 minutes until all the vegetables are tender. 3. Drain the vegetables and return the potatoes to the pan, leaving the courgettes aside in the colander. Using a fork, lightly break up the potatoes. Add the salad onions, olive oil and courgettes to the pan and lightly toss together. 4. Carefully snip open the Garnish & Go bags and transfer the garnished fish to 2 plates. Serve with the vegetables, spooning over the herby, buttery juices from the bag. Eat straight away. Try other combinations of fish and Garnish & Go flavoured butters — the Fennel Butter is fabulous with seabass, and try the Lemon & Pepper Butter with flat fish such as plaice.